Hi, I have Head PC 600 and as you know this is VERY flexible 18X20 racquet. I've used Luxilon Alu Power Rough 16L on my K-Factor Six-One Tour 90 (12 pts HL) with 52-56. It felt really stiff and hard? so no comfort at all. I have the reel of Luxilon Alu Power Rough so should I string this on my PC 600 or try another string? As K-Factor was 16X19, it might feel different. I will string whatever with 49 and I need a recommendation for any poly string that will feel better for dense pattern but flexible racquet like PC 600! Semi-Eastern/Western forehand and Continental with Semi-Western Two handed Backhand! I've always found ALU Rough on the softer side if you string it low (mid 40's). Some people really don't want to do that, though, so I'd understand not wanting to use a set of an expensive string on such an experiment. I have the chance to owe 2 of them, made in Austria, etc. Like you, I come from small headsize 16/19 rackets. So I wanted to find the same easypower and easy spin type of feeling with those 2 beautys. I've tested some polys at a range of tension from 14kg to 18kg max, 18 (40lbs) beeing an exception for super thin 1.10 Solinco G. Because I thought a thinner gage could give me more pocketing, and because the durability was not so important for me as I can't break poly with this racket, I did not tested something over 1,20mm gauge (excepted AluPower which is 1,25mm) . You might be afraid of how lose those tensions are, but they suit well for me as the rackets had softened with time, and lost the little power they had (made in 2000 aprox). So if you see Robin Haase stringing at 22kg, remember he uses a brand new carbon lay-out and puts a bit of lead which gives much more power to his frames. Ours are an other deal, unless you are using recent pro-stock pc600, which is another story. VS gut 130 main @18kg (20% pre-stretch) / Poly Fire cross @17kg - Obviously, that's the only setting whith which I really felt the pocketting I was looking for. Especialy with the Nat Gut hybrid, those set-ups were super super spinny. Solinco Tour Bite Soft 120. Felt cheaply extruded, not regular, no feel. I’ve really like Isospeed Cream at 50lbs so far. I have 5 hours with it so far and is holding up nice. It’s pretty powerful for a poly. @vsbabolat are you using the cream in 1,28 ? Meanwhile, I've tested Kirshbaum super smash 1,20 : very sticky, big lack of spin. Didn't like it. Gamma Moto 1,15 was very good. It got everything I like. Now using Volkl Cyclone 1,20 : Super lively, should have strung it tighter, like 20-21kg instead of 18. Good spin, loooots of power. Have you tried BB ORIGINAL 130 ? It was a dream of consitency, spin, precision, etc. I played my best tennis with it. But after 6 hours, as with every 1.20 poly, the tension drop was dramatic. Every main was moving, the ball were going long, the dream became nightmare. So I guess, as I don't have a stringing machine, I need to go 1.25 and never look back. Not to hijack this thread but.. where would you rank Isospeed Cream in terms of spin i.e., what is comparable? yonex ptp 125 in pink was fantastic. Sonic pro white was on the comfort side, not biting the ball as well as the yonex. Still very good. 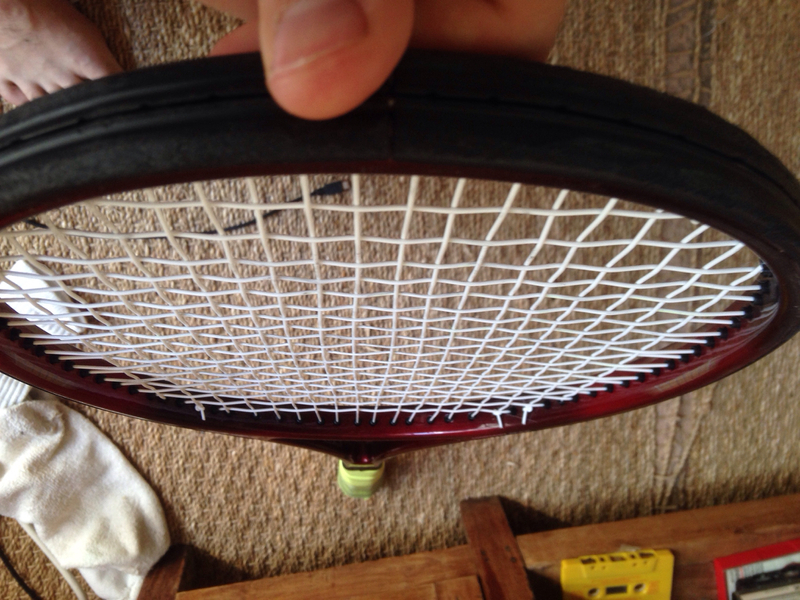 In fact, I cannot find a string that feels bad on that racquet. For this reason it's actually very fun testing all this polys. 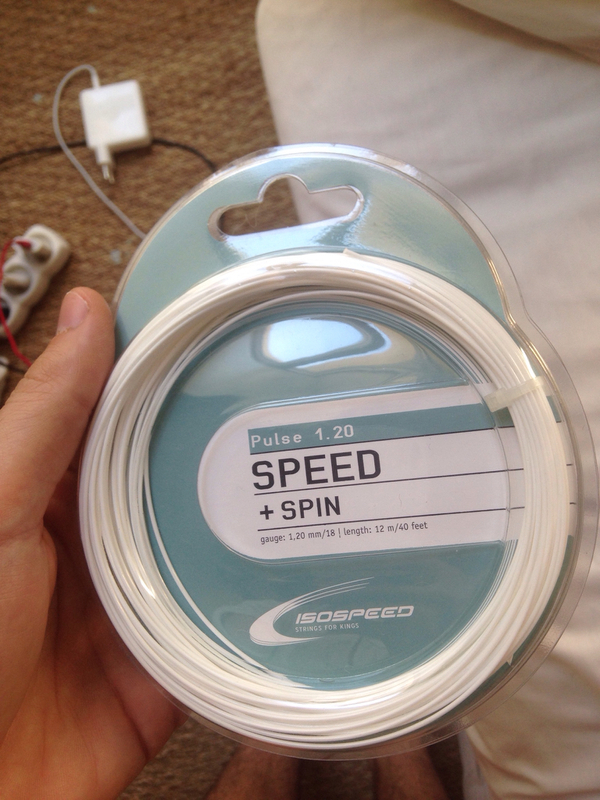 I am waiting for isospeed pulse 125, the string that I loved so mutch in 120, except for tension loss. Btw, yesterday the stringer nearby strung it 16x22. x) So he will free-string something of my choice. Would love to try Lxl ELEMENT. Hi guys. Not trying to hijack this thread but I'm going to be playing at a club that has PlaySight, so I can give you a comparo between my strings. I'm currently going through the motions trying to figure out which strings I like in my Prince Phantom Pro 93p. I have 3 and will string them with identical tensions so that the data will be apples to apples. Hopefully this is a useful contribution to this thread, considering its a flexible low powered frame too. I'll post the videos as soon as I have them so that you can see my swing mechanics. Currently, I'm loving a 16gTourBite mains/ 16gBB Origin cross at 56lbs. I have no idea why. I'm normally a Poly player. I'm going to string up a full bed of Tourna Big Hitter Black7 on one and another with Weiss Cannon Ultra Cable. I have my own stringing machine, so I haven't decided on tension yet. Maybe some input from you guys? I'll hopefully be doing this over the next few weeks, 3 diff setups at a time, and will share my findings. Provided that my wife lets me out of the house. If you guys have any future suggestions, let me know. Any reason you haven't tried 18g for the tight of a stringbed? Given that you string yourself. I was thinking of trying that on my PC600 and PS85. I've been going to my local shop to try and support the biz, and they happen to have the strings at a discount. I wasn't going to be picky at that point, but I do have the new polys in at 17g. my next round will be full beds of 18g hopefully. I let the guys at the shop know so they could order a couple sets for me. On a side note, I have a st vincent ps85 and have been stringing that one with a gut poly hybrid. I don't remember the playsight stats, but the spin difference with gut on crosses vs mains was significant. It only makes sense, but to see the difference in numbers was amazing. Poly on mains has been a staple for me ever since, on any setup. Luxilon Element is the best Poly I've tried yet. In full bed it has same pocketing as gut/poly hybrid. Spin is very good too. Way softer than any soft poly Iv'e tried, even Cyclone Tour (which is a bad string compared to Element), don't trust the tw string compare tool. Durability is very good too. Doesn't dry. Tested at 40lbs. Considering buying a reel! Og SHeep micro 1.25 main (46lbs) Isospeed Pulse 1.20 cross (44lbs) was very good and very cheap. Plenty of spin, control, and power when needed. Better durability and tension maintenance than full poly. I trimmed the cap grommets for her, with a blend of transparent grommets and black grommets. She is the best looking racquet in the world. Cyclone Tour strung at 42/40. Not that good! Plastic feel, dries fast, stop snap-backing after 2 hours... In the string compare tool, they say it has better spin potential than Lxl Element. For my IG Prestige Mids, I have been really liking the 18G Luxilon Alu Power, or the 18G RPM Blast. The RPM Blast feels more plush and powerful, and the Luxilon felt more solid and offered better comtrol, That said, I’m thinking about putting in some springly poly, like the RS Paris 16 or 17G, at higher tension around 53 to see how it does. Love the thin poly, but I would like my string to last me a bit longer.